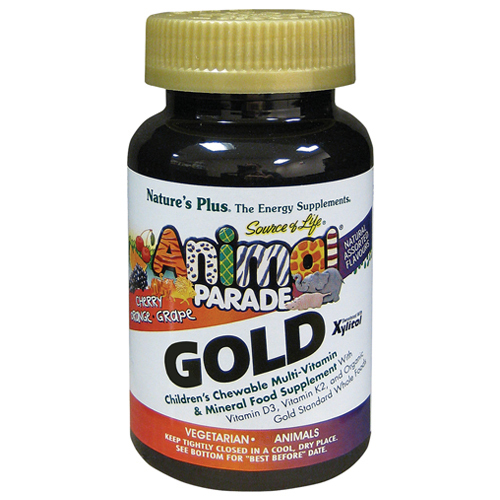 Nature`s Plus Gold Animal Parade Children’s Chewable Multi-Vitamin & Mineral with vitamin D3, vitamin K2, and Gold Standard Whole Foods. 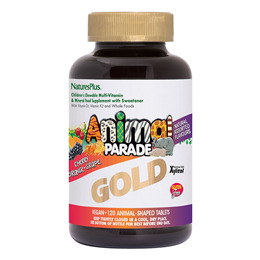 Nature`s Plus Source of Life Animal Parade offers a cascading variety of luscious flavours, enticing textures and diverse formulations - making nutritional supplementation fun and easy for you and your kids. Featuring whole-food fruits and vegetables, along with other critical vitamins, minerals and nutrients, Animal Parade delivers superior-quality support for children`s healthy growth and development. Like all Nature`s Plus products, Animal Parade vitamins and supplements for kids contain only the highest quality natural ingredients to help your young ones. Xylitol, Gold Standard Whole Food Blend (acerola extract, apple fruit, broccoli sprout, cauliflower sprout, collards, cordyceps mushroom mycelia, kale, kale sprout, maitake mushroom mycelia, parsley, beet juice, carrot, spirulina, shiitake mushroom mycelia, spinach, tomato juice, bilberry, blueberry, chlorella), natural flavours (orange, raspberry, cherry, grape), ascorbic acid, calcium (as aqueous-blended calcium carbonate and hydrolysed rice protein; tri-calcium phosphate; citrate), citric acid, binding agent (guar gum), d-alpha tocopheryl acetate, pineapple fruit, lubricant (stearic acid, magnesium stearate), niacinamide, kelp, calcium pantothenate, magnesium (as aqueous-blended magnesium oxide and hydrolysed rice protein; citrate), natural colour (beet, annotto, curcumin), biotin, beet (beetroot red), rose hips, brown rice, broccoli, spinach, mango fruit, carrot, iron (as ferrous fumarate), sunflower, flax, spirulina, Enzyme-Rich Whole Food Blend, non-GMO maltodextrin, sodium ascorbate, riboflavin, thiamin hydrochloride, menaquinone, potassium citrate, manganese gluconate/citrate, lutein, beta carotene, zinc oxide/citrate, pyridoxine hydrochloride, chromium picolinate, L. acidophilus, L. plantarum, Streptococcus thermophilus, lemon peel, potassium iodide, sodium selenite, cholecalciferol, calcium-L-5-methyltetrahydrofolate, methylcobalamin, anti-caking agent (silica). As a food supplement for children two years and older, two chewable tablets once daily. Below are reviews of Nature`s Plus Gold Animal Parade Multivit -120 Chewables by bodykind customers. If you have tried this product we'd love to hear what you think so please leave a review. My son (9) is really happy with this supplement, after trying lots and not happy with either the strength or the flavour. I'm pleased with the quality, although remember to take a calcium supplement if you take these, as that requirement isn't covered.